MacGyver has arrived to mobile devices! Do you remember the legendary TV series of MacGyver? One generation learned with this series how to make a parachute with some chopsticks, a rubber band and a plastic bag. Well, it has finally come to mobile devices in the form of a puzzle game. Fairplay Media has launched MacGyver Deadly Descent, a mobile game where we get into the skin of MacGyver, and we must use all our ingenuity to solve the challenges we are encountering. 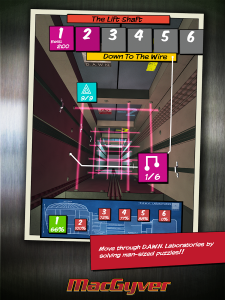 The game’s plot is simple: we have to infiltrate the secret laboratories DAWN to stop a terrible computer virus that has made that a group of scientists remain trapped in some place in the underground. It is a race against time, where we have to rescue all the scientists before they run out of oxygen. To do this, we need to solve all kinds of puzzles from six categories, ranging from logic to memory or ingenuity. Puzzles are classified under the following categories: laser quest, lockout, down to the wire, pipe fitter, direct current and chemical reaction. Each one challenges us to solve a problem because as we advance, we can move through the labyrinthine and secret laboratory. Puzzle games are very successful on mobile platforms, and there are numerous titles available on the market, from tittles as Escape the Mansion or 100 doors 2 to some real gems, like The Room 2. Lee David Zlotoff, writer and producer of the TV series, has participated in the production of this game, so we can expect to find something of the spirit of the original series. Basically, we have to find the clue to any problem using the materials we have available. The imagination and ingenuity play an important role, and probably there are challenges with more than one possible solution. 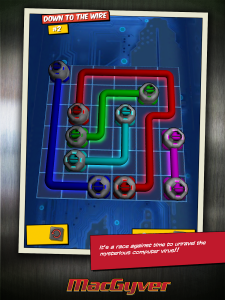 The game promises hours of fun amidst re-playable puzzles, with special rewards for the top players. The graphics has a 3D style that gives the game a nice aesthetic with good gameplay. However, if we can’t solve a puzzle, the creators of MacGyver Deadly Descent have prepared an app with complete and detailed solutions of all the puzzles of the game. If you get trapped in one of the many challenges that contain the game, you can always take a look at the solution provided by the app. MacGyver Deadly Descent occupies 56MB on the version for Android and 83.4 MB on the iOS version. It requires iOS 4.3 or later and it is compatible with iPhone, iPad, iPod touch, and Android 2.3. It is available for $2.99, without any in-app purchase, at the App Store and Google Play respectively.